Here are four reasons why you should homeschool Spanish. After coming up with the reasons I had to come up with a way to teach the language. My sons wanted to take a foreign language. I came up with five ways that my sons could learn Spanish. 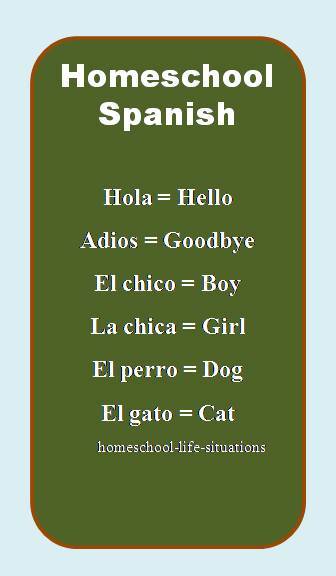 We did use two different approaches to homeschooling Spanish in our home. Although my sons are not fluent in the language they did learn some words. Spanish is easy for most people to learn. Each letter makes only one sound. The rules for grammar are simple to understand. I took two years of Spanish in high school. I did find the language easy to understand. I only had trouble learning pronunciation. It is also the 2nd most common spoken language in the world. There are a lot of Hispanic people living in the United States. You would have many opportunities to see and hear the language. Knowing Spanish might also help you get a job. Because it is a popular language there is lots of homeschool Spanish curriculum to choose from. Taking Spanish in high school satisfies the two year college entrance requirement. If you do not already speak Spanish you might want to find a tutor for your child. Another idea is to find a friend or neighbor that is fluent in the language that can help with pronunciation. If your child wants to learn with other students take a class. My older son took a class at a co-op. Many co-ops have beginning Spanish. If your child wants to continue with the language he might have to take a class at the junior college. If your child does decide to take a Spanish class at a junior college or even at a co-op be sure that it will satisfy the college credit. Many foreign language classes are for learning to converse in the language. You would be able to speak with native speakers but you would not be taught the grammar. If your child is fluent in Spanish but has not taken a formal class he could take the CLEP test and receive college credit for it. If you are comfort teaching the language find a homeschool Spanish curriculum that has a video or CD. Then your child will be able to hear the language. If you want to expose young children to Spanish pick up some familiar picture books from the library. Some of the books will also come with either a tape or CD so that you can listen to the book. My son used See It and Say It Flip Flop Spanish. The curriculum comes with 4 CD’s, picture cards with the Spanish word on one side and the English word on the other, a whiteboard paddle, whiteboard pen, and instruction manual. Most of the lessons in See It Say It use a CD and the picture cards. There are also fun games. We used the whiteboard to play Pictionary. Either my son or I would draw a picture on the board and the other person had to guess the picture in Spanish. In another game we placed all the cards that we had learned between two players. Then we listened to the CD. When Senoria Gose said a word the first person to recognize what she said would pick up the card. If a player made a mistake then all of his cards were place back in the pile. The object was to have the most cards at the end of the game. We were also encouraged to watch a familiar video in Spanish. We watched a Charlie Brown movie. See It Say It Flip Flop Spanish is great homeschool Spanish curriculum for beginning students. If it is for a high school credit you will have to add more instruction on grammar and the culture of Spanish speaking people. You can homeschool Spanish even if you are not fluent in the language.